Having one particular facial feature out of proportion to the rest can cause distress. Equally, the need to resort to surgery is perhaps not an attractive prospect either. There is now a vast selection of non-surgical treatments available to help reshape the nose, and the good news is that none of them involves incisions or scalpels. WHAT IS A NON-SURGICAL NOSE RESHAPING? HOW IS THE NON-SURGICAL NOSE RESHAPING PERFORMED? As with most dermal filler treatments, non-surgical nose reshaping is performed via injection. 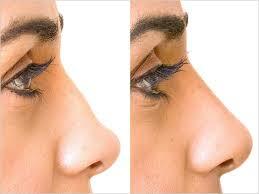 Dermal fillers will be injected either into the tip or into the bridge of the nose. Post injection, some minor massage and moulding will help finalise the result and desired aesthetic appearance. A treatment session for non-surgical nose reshaping will take between 15 and 20 minutes. In most cases, patients combine their non-surgical nose reshaping with additional wrinkle and anti-ageing corrections including Botulinum toxin, Dermal Fillers and Liquid Facelifts. Results will be immediate, although in some instances your nose may appear red and swollen for a few hours. The result traditionally lasts in excess of 9 months, with an average of between 12-14 months before a re-treatment is required. HOW CAN I MAINTAIN THE EFFECTS OF A NON-SURGICAL NOSE RESHAPING? Costs vary according to the amount of dermal filler required, the price starts at R5000.